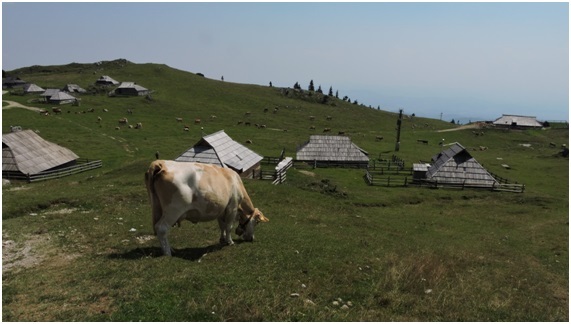 Our case study is focused on common land and especially on mountain pastures as the most often manifestation of common land in Slovenia by using the example of Velika planina Plateau located in the centre of Slovenia. The Velika planina Plateu is the largest Slovenian mountain pasture, in 2015 836 cattle were grazing there. Although the actual management and ownerships structure was set up at the beginning of the 20th century, the pasture has been operating for centuries. The period after the Second World War was very turbulent due to political turn-ups in what is nowadays Slovenia ending up in confiscation of all common land. However the pasture functioned according to established rules. This period also introduced new activities, skiing tourism, mountaineering, cable cars and additional mountain huts for turists. Although ownership issues have not been completely settled by now, the mountain pasture is a good example of a responsible relationship to communal property. It is proof that such property occupies an important place on the value scale of grazing-rights holders, who are aware that the mountain pasture represents not merely economic value, but environmental and cultural value as well. The mountain pasture is part of their tradition, inseparably connected with the settlements that the grazing-rights holders come from. Mateja Šmid Hribar, Ph.D., is a Research Fellow at the ZRC SAZU Anton Melik Geographical Institute (Ljubljana). Her research interests focus on sustainable governing and managing of cultural landscapes, human–nature interaction, the role of ecosystem services, governing common lands/commons, protected areas and heritage studies. Mimi Urbanc, Ph.D., is a Senior Research Fellow at the ZRC SAZU (Ljubljana). She has (co)authored several publications dealing with landscape changes, landscape perception, landscape representations, and common land. She is a board member of PECSRL and the editor of the Peter Lang series Exploring Cultural Spaces of Europe. Mountain pasturing in Slovenia is primarily linked to the Alps. They occur mainly in previously forested areas, with a few also at and above the tree line (Ringler 2009). The oldest written records of mountain pasturing in the Alps can be found in historical documents dating to 973 AD (Melik 1950). However, people have been present in mountain areas at least since 500 BC, but it is not known whether they used the areas for pasturing (Zega 1985; Rejec Brancelj et Smrekar 2000; Ledinek Lozej 2012). The availability of mountain pastures increased the chance of survival of many small farms. Because a mountain pasture was often connected with woodland pasture and because there was an increased demand for wood up until the mid-eighteenth century due to ironworking and mining, pasturing was limited by various laws and reforestation was promoted by still other laws (Melik 1950; Anko 1985). 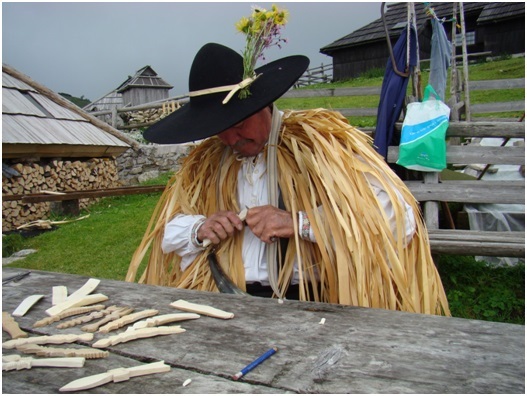 Slovenia has a rich tradition of common land dating far back to the period of tribal communities. This was usually uncultivated land intended for grazing, and common forests where wood could be harvested for personal use. By the end of Feudalism, the rights to common land were more or less uniform and depended on a person’s affiliation with a local community, but afterwards these rights started to differentiate (Vilfan 1996). The so-called agrarian communities were in charge of common management of agricultural and forest land (pastures, forests, fallow land, ponds), particularly in hilly areas which remained undivided after the completion of the agrarian reform in 1848 (Petek and Urbanc 2007). The right to use this property was tied to the farm and was only passed on together with the farm (Cerar et al. 2011). Common land was preserved up to the twenty-first century. However, due to political and economic changes in Slovenia (within Yugoslavia) after the Second World War, the development of common land was broken, agrarian communities were abolished and their property was nationalized. However, many agrarian communities continued their centuries-old practices, but within a completely different legal framework. After independency in 1991, Slovenia tried to enable the restitution of common land, but due to legal barriers in many cases the process is still going on (Šmid Hribar et al 2015). An example of a common pasture that survived until today are the common mountain pastures in The Velika planina Plateau with its unique cultural landscape and management system. The Velika planina Plateau is located close to the town of Kamnik in the heart of the Kamnik-Savinja Alps. It consists of at least seven herdsmen’s settlements. The settlements are surrounded by common mountain pastures that are located at an elevation between 1200 m to 1668 m above sea level. In the past this area used to be covered with forests. The significant characteristics of the Velika planina Plateau are (1) typical architecture with “herdsmen’s huts” whose roofs are covered with pine shingles and (2) the dual significance of the mountain regarding its seasonal users. Figure 1: The Velika planina Plateau (author: Miha Pavšek 2014). A mix of pastures, grassland, trees and rock surfaces, which represents a perfect foundation for the growth of numerous picturesque flowers, greatly contribute to beauty of The Velika planina Plateau. Spruce (Picea abies) and Larch (Larix decidua ) trees there are native species. Herdsmen used spruce wood for the construction of their cottages, roofing, fences and similar things (Velika Planina – Allong … 2015). Among shrubs Mountain pine (Pinus mugo) grows in large bunches above the treeline. Another typical shrubs and small bushes that can be found in the area are the following: Mountain avens (Dryas octopetala), Bilberry (Vaccinium myrtillus) and Hairy Alpine rose (Rhododendron hirsutum). In the early spring when snow melts away, pastures change in violet color covered with the blossoming Spring Crocus (Crocus vernus). Blue flowering Monkshood (Aconitum) and white Black hellebore (Helleborus niger) also contribute to the beauty of the place (Velika Planina – Allong … 2015). Figure 2: In early spring pastures are covered by the blossoming Spring Crocus (Crocus vernus) (author: Maja Topole 2009). Measuring about 1070 ha, The Velika planina Plateau represents the largest Slovenian mountain pasture. In 2015 836 heads of cattle were grazing there (Kemperl 2016, Koželj 2016, Potočnik 2016). While the lowest areas are still covered by a sparse forest of spruce, larch, and beech, the higher parts are rockier and only small patches of dwarf pines are found there. Mountain pastures on The Velika planina Plateau have probably been exploited since prehistoric times. This assumption is supported by archaeological finds and some cultural relics (Cevc 1996, 2000). The first historical source mentioning The Velika planina Plateu dates back to 1538, when the Count of Kamnik Andreas Lamberg sued the people of the town, who claimed grazing rights to the mountain pastures above the Bistrica Valley (Žnidaršič Golec 2008). This document also indicates that in the Middle Ages there were horses on the mountain and not cattle, like today. The historical sources available indicate that The Velika planina Plateu belonged to the imperial estate managed by Kamnik noble families as far back as the early Middle Ages. 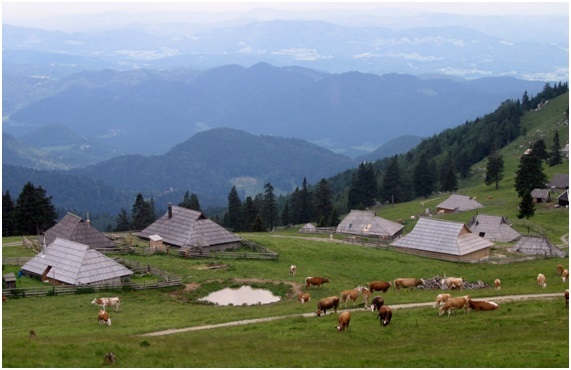 In order to acquire grazing rights, farmers needed to pay compensation to the nobles (Velika Planina 2012). Information in the Theresian (1749–1754), Josephinian (1779), and Franciscean (1825) cadastral surveys shows that in the mid-eighteenth century there were 171 locals with the right to pasture their animals on the mountain (Velika Planina 2012). Due to the livestock structure having been grazed there, The Velika planina Plateau was considered a mixed mountain pasture for a long time. The right to the mountain pastures could not be bought or sold separately from property, but it could be only inherited together with the estate. In the case of division of the property among several heirs, the right was allocated to one heir only. In the past there was also a rule on the number of livestock pasturing in the mountain: each beneficiary (rightful claimant) could pasture only the same number of animals as they could be fed with the fodder from his own estate. Because of constant disagreements among the herdsmen, it was finally decided in 1913 to split the area into three units: the Velika planina (literary Big mountain pasture), Mala planina (literary Little mountain pasture), and Gojška planina (named by village Gozd which literary means Forest) and set up borders between them. The rules have been no longer so strict; for example, one rightful claimant is allowed to bring more livestock as entitled, but it is required to pay for each additional animal, and so on. Together with grazing rights, beneficiaries also gain the right to build herdsmen’s huts. In 1913, a decree was adopted specifying the number of livestock units the grazing-rights holders were allowed to graze (twelve cattle for bigger owners and six head for smaller owners) and the amount of trees they were allowed to cut down on the plateau (16 m3 for bigger owners and 8 m3 for smaller owners). According to a source from 1913, 69 beneficiaries had grazing rights to Velika planina, 37 to Mala planina, and 61 to Gojška planina. Figure 3: The Velika planina Plateau in summer time (author: Matija Zorn 2015 ). Fresh water raises a particular problem on The Velika planina Plateau because it is a high-elevation karst plateau. Up until the twentieth century, the herdsmen kept wooden troughs in their huts for melting snow, which they would carry on their backs during droughts (Cevc 1993, 25). They also fetched water from springs and watered their livestock in small ponds. 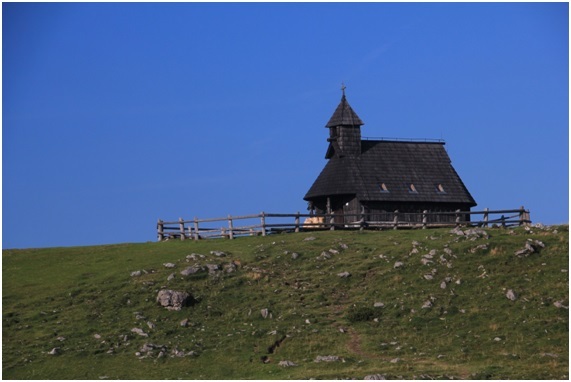 Figure 4: The chapel of Snow Mary which originally stood at the same place before the Second World War, was rebuilt in 1988 on the herdsmen’s initiative (author: Matej Gabrovec 2015, source of data: Velika planina 2012). Around 1910, the pioneers of high-mountain skiing in Slovenia came on the scene, and as early as 1924 The Velika planina Plateau was mentioned as part of the history of ski tourism in Europe. The number of skiers on The Velika planina Plateau grew, and the Slovenian Alpine Club’s lodge was unable to house them all; therefore, in winter and spring skiers tended to increasingly rent and stay overnight at herdsman’s huts, which is when this tourism phenomenon began (Hlačer 2000). In contrast, in Austria and Switzerland skiers returned to the valley every night. The herdsmen added stoves to their huts and built windows so that they could command higher rents. This developed into a system that still exists, where from June to September herdsmen tend to their cattle and from October to May another group of people that have made special arrangements with the owners of the huts, i.e. cottagers (Sln. bajtarji; seasonal renters) live in the huts. These renters are obliged, among other things, to look after the huts and repair them (Potthoff 2016). This shows not only an example of human interaction with nature, but also a very special cooperation between tourism and the use of mountains for agricultural purposes. Figure 5: The Velika planina Plateau in winter time with the church in the front (author: Maja Topole 2008). The mountain pastures on The Velika planina Plateau – despite being divided into three individual units – form functional and spatial whole. Centuries long land management results in a combination of grassland, forest, and herdsmen settlements. Figure 6 and 7: A typical cultural landscapes of Gojška planina (above) and Velika planina (below) (author of figure above: Miha Pavšek 2007; author of figure below: Matej Gabrovec 2015). Despite property shake-ups after the Second World War and introduction of new functions (tourism) accompanied by new landscape elements the landscape of The Velika planina Plateu conveys high degree of natural preservation, landscape diversity, and symbolic value. Velika planina were burned down and therefore after the war the herdsmen built new huts with a square floor plan, an open south side, and windows (the old huts did not have any windows; Kopač 1995, 85, 88). As in other Slovenian mountain pastures, the property of agricultural communities on Velika, Mala, and Gojška planina was also nationalized after the Second World War. In 1957, agricultural officials considered razing the huts on The Velika planina Plateau and building cooperative farms instead. Fortunately, this idea was never carried out, largely thanks to the architect Vlasto Kopač, who belonged to Cottagers group and who in 1965 prepared a proposal to declare The Velika planina Plateau a protected landscape area and thus saved its herdsman architecture. Currently, The Velika planina Plateau is registered as a cultural landscape and as a geomorphological natural feature. Additionaly, the Preskar’s Hut has been protected as a monument. After the Second World War, this was the only hut that was renovated in exactly the same style (without windows and a chimney) as it had before it was burned down and is the only preserved example of an oval Velika planina–style hut in Slovenia (Štefe 2012). It now houses a museum. Figure 8: A renovation of typical herdsman’s hut in The Velika planina Plateu (author: Miha Pavšek 2011). During 1950s to 1970s The Velika planina Plateau saw the development of tourism and therefore Kopač prepared a spatial arrangement and plan for tourist huts that are derived from herdsmen’s huts in line with efforts to preserve the typical cultural landscape. 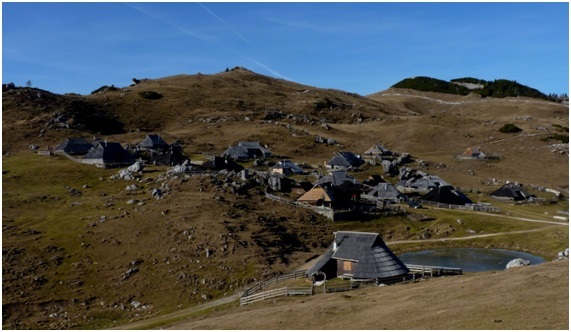 He placed the vacation cottages in a separate tourist village in the northwestern part of The Velika planina Plateau. In this way he preserved all three mountain pastures intact. Kopač’s work was later continued by his daughter Mojca Kopač who prepared a study on valorisation of landscape area of The Velika planina Plateu for development. On 15 July 1951, the freight cableway to the Mala planina began operating; its use was halted only in 1963, when the cable car to the Velika planina was opened. Between 1953 and 1970, three mountain lodges were also built on Mala planina. The cable car and the mountain lodges stimulated tourism development in the 1970s. To revive the area even more, the RTC Velika planina Plateau Self-Managing Community of Interest was established in 1981 and plans to expand tourism activity were also considered; however, this was not in agreement with the predecessors’ efforts to separate the locations of tourism and pasturing activities. On the other hand, tourism also had its positive side because at the end of the 1980s it turned out that pasturing became more lucrative due to selling dairy products to tourists and renting out huts. Around 1993, cars began to be used on the plateau. Figure 9: A herdsmen in typical costume making wooden seals engraved with various ornaments to adorn the Trnič hard cheese (author: Miro Štebe 2007). Figure 10: The most unique dairy product is the hard cheese called »Trnič«, also known as a symbol of love (author: Miro Štebe 2010). In 1994, the procedure for restoring property to the owners that had lost it in 1949 and 1957 began. This was the beginning of a new revival and use of the shared property as part of the agricultural communities on Velika, Mala and Gojška planina. Despite the procedure described above, in 1998 the Municipality of Kamnik wanted to declare the majority of area on Velika and Gojška planina as sports locations of national importance; however, the grazing-rights holders successfully fought this because they believed this declaration meant that the plateau was to be nationalized again. The Velika planina Plateau, one of the oldest and largest mountain pasturing areas in the Slovenian Alpine region, has remained an active mountain pasture until this very day. It is managed by agricultural communities. At least once a year, usually at the end of April or the beginning of May, all the grazing-rights holders of an individual agricultural community gather at a meeting where they discuss tasks that concern everyone (e.g., repairing the roads and fences, cleaning ponds and springs, fertilizing and clearing the pasture, and so on; Velika Planina 2012). Except for occasional disagreements between the co-owners (e.g., farmers vs. non-farming owners) that arise from conflicts of interest, there are no major changes in plateau management because ownership does not automatically give new owners the right to build new huts. In addition to the grazing rights, this right continues to be defined by the Statute on Managing and Using Shared Property (Kemperl 2012). A possible source of disagreement in the future may be various prohibitions and limitations connected with the potential protection of the area. Figure 11: The Velika planina Plateau just before snow (author Maja Topole 2007). Anko, B. 1985. Terezijanski gozdni red za Kranjsko 1771. Ljubljana: VTOZD za gozdarstvo BF. Cevc, T. 1993. Velika planina: življenje, delo in izročilo pastirjev. Ljubljana. Cevc, T. 1996. Davne sledi človeka v Kamniških Alpah. Arheološke najdbe v planinah (1995-1996). Ljubljana. Cevc, T. 2000. Tri tisočletja Velike planine. Kamniški zbornik 15, str. 113-122. Kamnik. Hlačer, T. 2000. Ko se planina preobleče, bajtarstvo Velike planine. Ljubljana. Kopač, V. 2006. Iverí z Grintovcev. Ljubljana. Ledinek Lozej, Š. 2012. Planšarstvo: predstavitev primera paše in predelave mleka v visokogorski bohinjski planini Krstenica. In: Porenta, T., Terčel Otorepec, M. (Eds. ), Etnologija in slovenske pokrajine: Gorenjska. Ljubljana, Slovensko etnološko društvo, pp. 109-121. http://www.sed-drustvo.si/upload/files/content/zbornik-Etnologija%20in%20slovenske%20pokrajine-internet.pdf (23.11.2012). Melik, A. 1950. Planine v Julijskih Alpah. Slovenska akademija znanosti in umetnosti. Ljubljana: Inštitut za geografijo. Rejec Brancelj, I., Smrekar, A. 2000. Gorska ranljiva območja – primer Triglavskega narodnega parka. In: Špes, M. (Ed. ), Pokrajinsko ranljiva območja v Sloveniji. Ljubljana, Institute of Geography, pp. 47-69. Ringler, A. 2009. Almen und Alpen. Ökologie, Nutzung, Perspektiven. München: Verein zum Schutz der Bergwelt. Vilfan, S. 1996. Zgodovinska pravotvornost in Slovenci. Ljubljana. Zega, D. 1985. Zgodovinski pregled. In: Fabjan, I. (Ed. ), Triglavski narodni park: vodnik. Bled, Triglavski narodni park, pp 182- 193. Žnidaršič Golec 2008. Spori zaradi Velike planine po sodnem zapisniku iz leta 1540. Kamniški zbornik XIX. 115-127.